Ask fellow campers about "Shell Mound County Park" and nearby attractions. This small park is well worth the money. During our 2 night stay we had the place to ourselves. The caretaker was friendly and helpful, the park well kept and clean. It's a bit off the beaten path and you should definitely stock up before you get there because there's not even a Dollar store in sight. Directional signage was adequate, we had no trouble finding the park. The site surface was well packed limerock. Even though we had a couple of really heavy rains, we had no trouble with standing water. Our trailer is a 26 footer and we had plenty of room. Really large RVs may be a bit cramped. Be advised that this campground does not accept reservations and payment is cash only. We would definitely stay her again. We camped at Shell Mound County Park in a Travel Trailer. Be sure and check out the shell mound and the birding and observation deck. A visit to Cedar Key and the Cedar Key Museum is a great side trip. 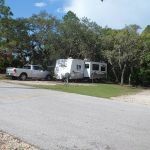 This is a county campground about 9 miles or 15 minutes outside of Cedar Key. It was very hard to find information on it and to find the location. The campground is inside the Lower Suwannee National Wildlife Refuge. There are some great, short hiking trails in the Refuge, just a short distance from the campground. There is an on-site manager that you register with and pay the fee. Cash only. The price is certainly right for a 30 amp and water site. The sites are dirt with a somewhat haphazard arrangement. The 30 amp was strong and allowed us to use our air conditioner. Since it is along the water the no-see-ems and mosquitoes are a real presence. Many of the sites would not be suitable for RV’s or it would be very hard to level. There are about 8 good sites. When we were there we had about 4 other RV’s and 4 or so tent campers. There is a busy boat ramp in the park and boats, including noisy air boats, go out at various hours, but we did not find that a big problem. There was quite a bit of late night music during our visit without a lot of presence from the on-site manager. We were able to get satellite without a problem and that would be true at most sites. Our Verizon phone and data were marginal. There is a dump station but you have to look carefully. You need to remove a chain across a drive near the restrooms and back in to dump. A bit strange but it worked OK. If visiting the Cedar Key area we would likely stay here again. With the cost and location it is hard to beat. We camped at Shell Mound County Park in a Motorhome. This campground is administered by Levy County in the Lower Suwanee National Wildlife Refuge. It is small and well-kept, with friendly office staff. The campground is very close to the water, but not right on the shore. Extremely quiet. Clean restroom and shower building. The Refuge offers hiking trails, fishing, birding, kayaking, and an archaeological site (the shell mound) There are new fishing/birding decks. We had excellent cellphone coverage and MiFi reception here. Close to the town of Cedar Key, but stock up on supplies at Chiefland on your way down. Length of stay here is limited to 7 nights. We camped at Shell Mound County Park in a Motorhome. Are you affiliated with Shell Mound County Park ?